By South Sea Imports. Background color: Red w/ Purple, White Yellow & Orange Flowers. 100% Cotton Fabric. To be cut as one continuous piece! Sold by the yard. Fabric is 100% cotton. My pictures on my monitor are as close to actual colors as I can get. Collection: Windflower. Designer: Daphne B. Fabric has rust, brown, and mustard damask designs on a warm beige background. This fabric is sold by the yard. General Information: 100% cotton, 44/45" wide. "Simply Irresistible" by Robyn Pandolph for SSI. Collection / Print #: Floral Harmony Collection / Diagonal Floral Stripe. This fabric is: 44" wide, 100% cotton, new and right off the bolt. All of our fabrics are from a smoke-free, pet-free, clean studio. When you do, look at the Total price in the top right corner. The fabric is being sold by the half-yard. 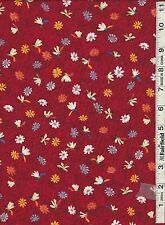 Beautiful fabric from Robyn Pandolph's Cinnamon Girl collection for SSI. Olive and sage green with flowers and scrolls. This is 100% cotton. Each fat quarter is 18" x 22". This is for a total of 2 3/8 yards. There are 6 blocks/squares on the panel that are 11" x 11". Photo #1 shows all fabrics, Photo #2 shows the panel. Collection / Print #:Floral Impressions Collection. This fabric is:44" wide, 100% cotton, new and right off the bolt. All of our fabrics are from a smoke-free, pet-free, clean studio. This is a standard weight/standard width fabric. Cotton Fabric. If this happens, I will make every effort to make it right. Due to differences in computer monitors, and other devices used to view online images, actual colors may vary slightly from those shown. Perfect for a table runner, place mats or even napkins. Delicious Red Apples on a dark olive green background on cotton by Teresa Kogut of South Seas Imports. Apple Cider Red Apples. top quality 44/45" wide 100% cotton fabric. 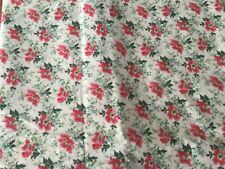 SIZE: It measures 1 yard x Standard With (both selvedge edges are there) MATERIAL TYPE: It is a cotton type BRAND: It is marked Matters of the Heart Kaye England SSI PATTERN/DESIGN: It has a floral pattern This print is being sold by the cut yard not continous. . It features small strawberries & green leaves on a yellow background. There are also faint white leaves & vines that can be seen on the close-up photos. It is 45" wide. It has not been laundered. Rare - Out of print. Designed by Kaye England. Flat rate boxes are now available! Collection / Print # Illuminating Spring Collection / Floral in Coral-Pink, Cream, Mauve. Made by: South Sea Imports Fabric s. This fabric is: 44" wide, 100% cotton, new and right off the bolt. All of our fabrics are from a smoke-free, pet-free, clean studio. complements leafy scrolls in lavender cotton 3 yds x 44"
100% cotton quilt fabric, sold by the piece, 3 yards x 44". our pictures are taken on a cutting board grid with 1" squares, so you get an idea of the size of the print. txzj pxzj6103 txzj5 txzj62. 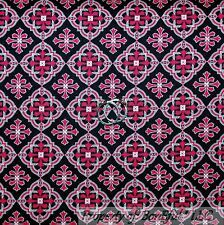 SIZE: It measures 1 yard x Standard Width (both selvedge edges are there) MATERIAL TYPE: It is a cotton type BRAND: It is marked SSI Cheri Strole PATTERN/DESIGN: It has a Ornate Fleur de Lis type pattern . Collection / Print #: Sunshowers Collection / Print 99121 Daisies Allover. Made by: South Sea Imports Fabric. This fabric is: 44" wide, 100% cotton, new and right off the bolt. All of our fabrics are from a smoke-free, pet-free, clean studio. 2/3 YARD CUT OF FABRIC. YOU ARE buying a new piece of 100% cotton, fabric. The width of this fabric is 40". If you buy more than one quarter yard it will be in one piece. For instance if I can use a flat rate envelope or box for cheaper. SIZE: It measures 1 yard x Standard Width (both selvedge edges are there). MATERIAL TYPE: It is a cotton type. BRAND: It is marked Forever Yours Robyn Pandolph SSI PATTERN/DESIGN: It is a floral pattern . Type of fabric: Quality quilting fabric. Manufacturer: South Seas Imports. For your consideration is the following fabric that has been languishing in my fabric stash. Major color: Rust. Stats on the fabric. Type of fabric: Quality quilting fabric. Amount: Fat quarter. 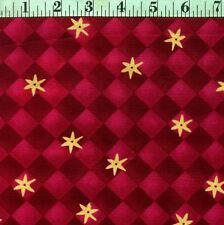 For your consideration is the following fabric that has been languishing in my fabric stash. Major color: Rust. Stats on the fabric. This is a listing for lot of fabrics put together by What the World that are coordinated for you for a quilt/craft/sewing lot / kit. We have hundreds and hundreds of these lots/kits in various themes that are being listed. 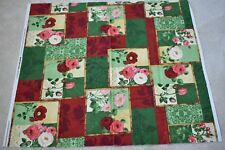 The following is what is included: They are 4 fabrics from SSI Matters of the Heart Kaye England 1/4 yard square pattern green 1/4 yard square pattern pink 18" x 20" circles floral 18" x 20" floral They are cotton . Green and pink florals on a mottled blue background, as shown in the picture. 100% cotton quilt fabric priced as 4 yards x 45" - if you buy 2 pieces it will arrive un-cut. PATTERN/DESIGN: It has a mod Floral pattern IMPORTANT INFORMATION. AtWhat the World you'll never know what you will find. Therefore, I do not typically know the history of the item. MATERIAL TYPE:It is a cotton type. EACH of the quilt fabrics shown from "Floral Calligraphy Collection " by Blum Studio for South Seas Imports. This is 100% cotton. Have more of these fabrics in Different colorways ! Can be used for any quilting or sewing project. Use for quilting, pillows, apparel, accessories, aprons, or anything you can think of. You may combine orders from different patterns/prints. Yardage is cut continuously. This is a large striped fabric with beautiful autumnal colors and designs. It has sunflowers, berries and fall leaves. This is a new, never used fabric that is 100% cotton. Suitable for quilting, curtains. Cruising". 1yard 42" wide featuring jungle. South Seas Imports fabric by. 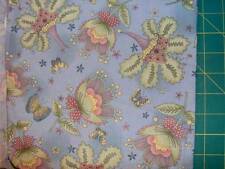 New fabric unused excellent condition. 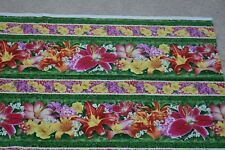 5Strips-Five Different Green Fabrics-2 Floral; 2 Smudges; & Columns of Objects. FABRIC #1=1 Strip (18” X 14”)= Tiny Turquoise-Green Vines & Tiny Coral/Blue Dots on Black by Fabric World. 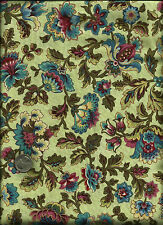 FABRIC #2=1 Strip (29” X 19”)= Black Vines & Flower Buds on Dark Army Green by Fabric World. FABRIC #3=1 Strip (27” X 19”)= Light Army Green Smudges on Army Green by Blank Textiles. FABRIC #4=1 Strip (19” X 14”) = “Tie-Dye Fabric Art”” (White & Dark Green Smudges on Green) by SSI. FABRIC #5=1 Strip (17” X 16.5”) = Columns of Dark/Light Army Green Objects Separated by a Army Green Braid Pattern by Fabric World. All Five Fabrics are 100% Cotton & can be wash as follows: Machine wash Cold Water tumble dry Gentle Cycle , Don’t use Chlorine Bleach.